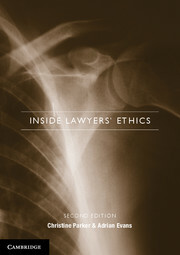 Inside Lawyers' Ethics is a lively and practical values-based analysis of the moral dilemmas that lawyers face. It gives lawyers the confidence to understand and actively improve their ethical priorities and behaviour when confronted with major ethical challenges. It identifies the applicable law and conduct rules and analyses them in the context of four different types of ethical lawyering: zealous advocacy, responsible lawyering, moral activism and the ethics of care. This new edition is fully updated, with a new chapter on confidentiality and new case studies and review questions. This edition also contains a self-assessment instrument designed to allow readers to recognise the type of lawyering that most appeals to them. Inside Lawyers' Ethics promotes self-awareness and offers a positive and enriching approach to problem solving, rather than one based on the 'don't get caught' principle. It is essential reading for students of law and newly qualified legal practitioners.